Abstract: Autonomic computing requires reliable coordination between different systems. The unexpected behavior of any component may endanger the performance of the overall system. For this reason, it is necessary to prevent and detect this type of situations and to develop methods to react accordingly and to mitigate the possible consequences. 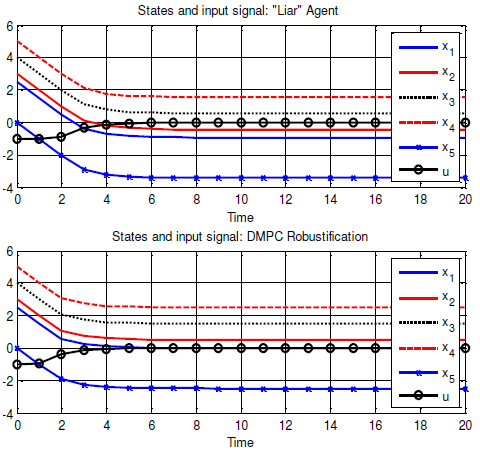 In this work, we present an analysis of the vulnerability of a distributed model predictive control (DMPC) scheme in the context of cyber-security. We consider different types of so-called insider attacks. In particular, we consider the presence of a malicious controller that broadcasts false information to manipulate costs for its own benefit. Also, we propose a mechanism to protect or, at least, relieve the consequences of the attack in a typical DMPC negotiation procedure. More specifically, a consensus approach that dismisses the extreme control actions is presented as a way to protect the distributed system from potential threats. Simulations are carried out to illustrate both the consequences of the attacks and the defense mechanisms. Reference: P. Velarde, J.M. Maestre, H. Ishii, R.R. Negenborn. Vulnerabilities in Lagrange-based DMPC in the context of cyber-security. In Proceedings of the 14th IEEE International Conference on Autonomic Computing (ICAC 2017), Columbus, Ohio, pp. 215-220, July 2017.